Try some pinspot lighting. Pinspot is a light with a very narrow beam that is used to highlight centerpieces, making them appear to glow, resulting in a spectacular effect! Conventional pinspots have a warm color cast while most LED pinspots have a very cool color cast. Great for table settings at the reception. So, forget the candles. 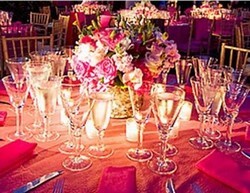 Pinspot lights are perfect for higlighting table centerpieces at wedding rehearsal and reception dinners. AVIVA carries the OPTIMA PAR36 PINSPOT. The unit shines a tight focused beam of light and can be used with dimmers or chasers. For dramatic effects use this lamp with colored gels. 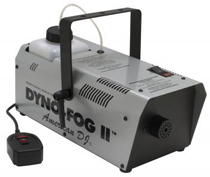 Of course, to enhance the beams of light use this lamp with a fog machine from AVIVA Rentals.